Please keep up the “Kindness Matters” meter at home because we see the needle moving at school! Mahalo for your support! Please have a look at this month’s news and updates. This Friday is Love of Reading Night and we are looking forward to seeing you and your family here. Celebrate the classics and watch book characters come to life, they might even read a book to your little one if you ask nicely. Click on the PDF below to find out more. Have look at the very important dates that you must put on your calendar NOW… there is a bedtime story reading by Dr. Noh, parent conferences, photo retakes, carnivals and much more that need to go on your calendar… CLICK. Please don’t forget to turn in your federal survey cards, it only takes about two minutes to complete and our school needs the precious funding dollars. Kaʻōhao School is very fortunate to have a School Director like Dr. Noh. While you guys got an extra day to relax with your child last Friday, Dr. Noh allowed for the staff to work the land at Ulupo Heiau State Historic Site and learn more about Kaʻōhao for our Professional Development Day. Not only did the staff help to weed, harvest and replant native Hawaiian plants, we were also gifted with fellowship and laughter. Mahalo to Dr. Noh and Ulupo Heiau Historic State Site.There is an opportunity for you to learn more about Ulupo Heiau and Kaʻōhao while you turn your hands to the land and help. 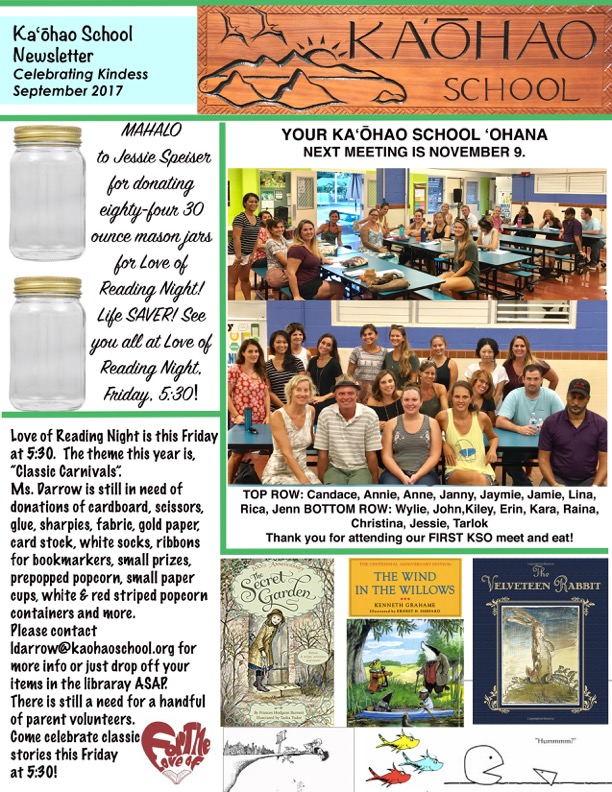 Please contact echapman@kaohaoschool.org for more info. Just one click on the PDF below and you will get all the latest info.